Learn just what the typical tuition is for U.S. undergrads throughout the nation, and how Cal State San Bernardino stacks up. Be prepared economically for your degree. Contrast California State University - San Bernardino's fees and tuition to U.S. schools. Look for price tendencies and increases to find out if you should expect to set aside more money for the following 4 years of paying for college. How do Fees & Tuition at Cal State San Bernardino Compare to Other Colleges? For nationwide, regional and statewide comparisons, check out the following table to find out how Cal State San Bernardino compares to other colleges. The cost of tuition and fees at Cal State San Bernardino is reduced dramatically for students from California. Tuition and fees for in-state students is set at $6,885 for the 2017 - 2018 year, a 63.3% discount off the price charged to out-of-state students. Tuition is $5,742 and fees $1,143. Cal State San Bernardino tuition and fees for out-of-state undergrads is $18,765 for the 2017 - 2018 school year. $1,143 was fees, and $17,622 was tuition. How much does Cal State San Bernardino cost per credit hour? For more info, visit Cal State San Bernardino Part Time Tuition & Fees. California State University - San Bernardino tuition and fees for out-of-state students increased with a typical yearly rate of 0.2% within the last five years. Over that same period, tuition increased by 0.0% and fees increased by 1.4%. Based on this, we predict the price of tuition and fees this year will be $18,793. At this rate, we estimate the total cost of tuition and fees for a two year degree to be $37,614 and for a four year degree to be $75,342. Remember, this doesn't cover other charges including room and board, transportation, and books. 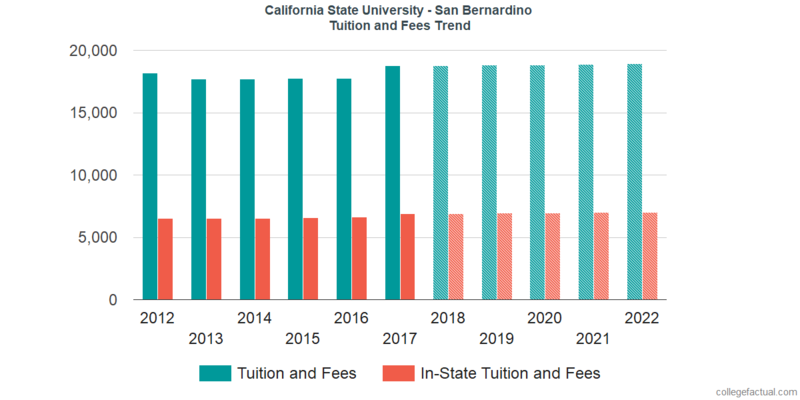 Look at this next chart to find out how Cal State San Bernardino tuition and fees may develop including residence based reductions in the years to come. Because of the cost of living along with other factors, the cost of college is likely to grow each year. For this reason your last year of school will be much more than your initial year.